We are sharing a very useful one of its kind photorealistic laser cut logo mockup psd with smooth edges. Place your logo mark, logo type to get a 3D logo effect. 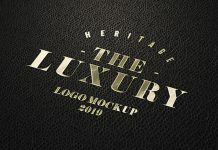 Use wide elements and typeface that are bold to get a realistic depth of the logo mockup.